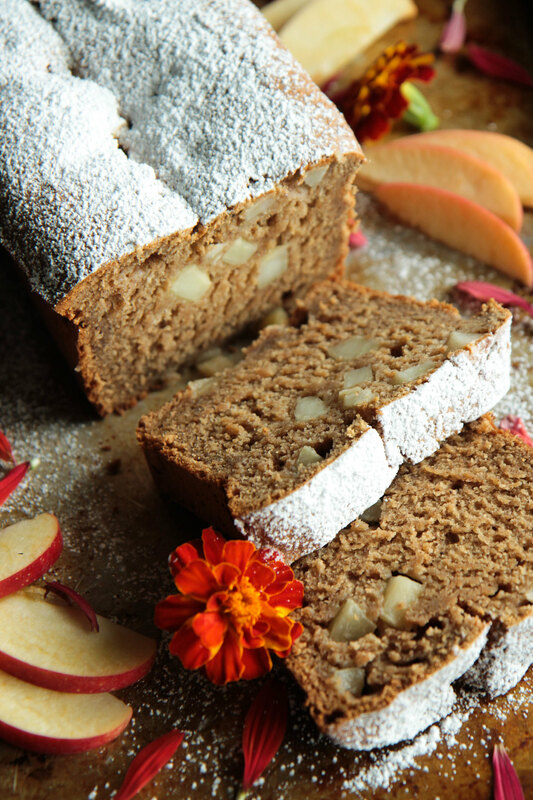 I’m so happy to bring you a brand new video and recipe for this tender, moist spiced apple bread is a dreamy breakfast or after-school snack that will win raves with your family! It’s GF and Vegan and absolutely screams fall, you are going to love it! It is truly feeling like Fall in Seattle. We were in Vancouver setting up our new townhouse that we will be living in during Coco’s filming on Friday and got back Saturday afternoon. By Sunday it was as though Fall had completely set it. The leaves are all turning and falling, it’s been raining and their is that wonderful damp smell of leaves in the air that just IS fall. Pia and I did a bunch of baking since we were fully in the mood on Sunday and this was one of my creations that I am really happy with. It’s so simple and delicious and reminds me so much of a loaf that my mom used to bake when we were kids. It will have your whole house smelling like heaven. 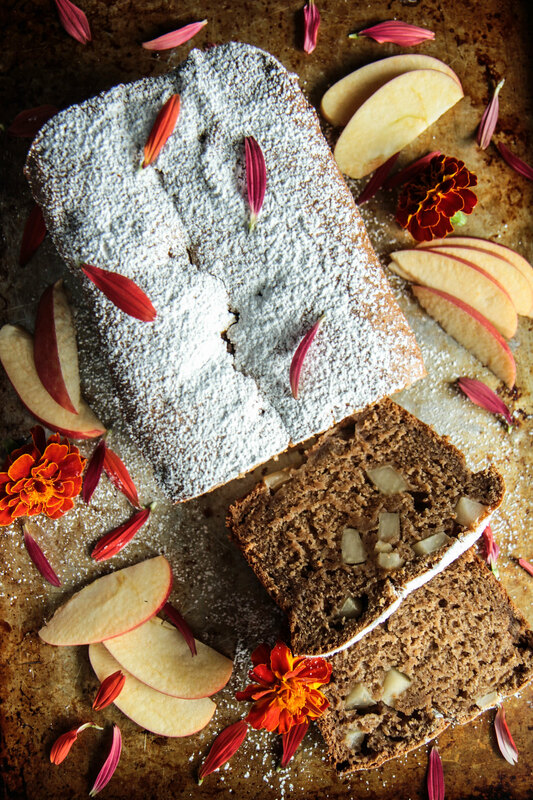 We settled in to a big new 1000 piece jigsaw puzzle, big fat slices of this spiced apple bread and steaming mugs of spiced apple cider (mine had whiskey in it) and it basically made me giddy with fall happiness! As I write this, I am actually in LA with Coco for a few days, where it is 77 degrees in the evening (oh man!!) but I will be back in the Northwest soon enough and making a loaf of this bread to hit the road to Vancouver with! In the bowl of a standing mixer, combine all of the dry ingredients. Add the applesauce, oil, coconut milk and vanilla then whisk until well combined. Gently fold in the apples and transfer the batter to the prepared loaf pan, spreading it evenly into the pan. Bake the loaf for 60 minutes at 350 degrees. Remove the loaf from the oven and then let cool before sprinkling with powdered sugar. Slice and serve. Store in an airtight container or Ziploc at room temperature. Looks good! How much coconut oil? I used 1/2 cup coconut oil. Bread came out perfect. In the recipe, is it 1/2 cup coconut oil? This is a fall breakfast dream come true! I’m new to your site and new to this way of baking. I’m excited about all these great recipes! Have you tried Bob’s Redmill 1 to 1 gluten free baking flour? It has the xanthan gum right in it. I’m curious how I would adjust recipes such as this if I were to use that flour. Hi Heather! I have tried it and you could absolutely use it for any of my recipes and just ignore the xanthum gum in the recipe!